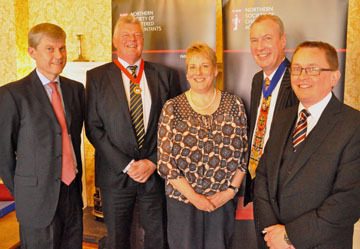 Northern Society of Chartered Accountants is delighted to welcome a new President and team for 2015-16. 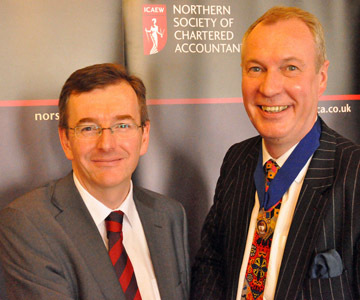 Northern Society, the membership body that represents 4,000 ICAEW Chartered Accountants and ACA students across the north east and Cumbria welcomed Rob Tindle as President for the 2015-16 year. Rob assumed the voluntary role of President at the recent AGM and will serve in office for the next 12 months. Rob had previously served as Deputy President and before that as Vice President and Honorary Treasurer. He takes over as Northern Society President from Andrew Jackson who championed the work of local chartered accountants across the business and finance profession during 2014-15. Rob is a Partner at Tindle’s Chartered Accountants specialising in Business Advice to SME clients. He is ex big firm having initially trained as an auditor and recently completed 6 years on the Audit Registration Committee of ICAEW. He is currently a member of the ICAEW Review Committee and is the Chairman of the Teesside General Practitioner Group (GPG). Rob is a former Chairman of Teesside Society of Chartered Accountants, one of the three branches that make up Northern Society. Rob welcomed his team into office for 2015-16 and looked forward to working with them to support local finance professionals working in the private, public and not for profit sectors across the North East, Teesside, northern Yorkshire and Cumbria. The office holders are part of the General Committee of Northern Society which is the volunteer team who arrange events and support the work of local chartered accountants. One of Rob’s first roles will be to announce the winner of the Accountancy Firm of the Year 2015 at the North East accountancy Awards, sponsored by ICAEW and Northern Society. Rob also looks forward to welcoming as many members and their guests at the Northern Society Business and Awards Dinner which will be held at the Civic Centre, Newcastle upon Tyne on 16 October 2015 with the principal speakers Baroness Tanni Grey-Thompson DBE and ICAEW President Andrew Ratcliffe. 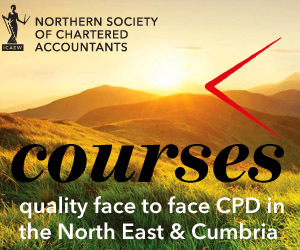 Northern Society of Chartered Accountants (NorSCA) represents 4,000 ICAEW Chartered Accountants and ACA students working in business and the finance profession across the North East of England, Teesside, Northern Yorkshire and Cumbria. We have been assisting businesses in the north of England and producing chartered accountants for over 130 years. Our members are part of a worldwide network of 144,000 ICAEW Chartered Accountants who help people do business with confidence.